Over 450 GCC bankers will come together next month at one of the region’s largest banking technology and innovation event – the 5th AnnualMiddle East Banking Innovation Summit, that will take place on14th and 15th September 2015 at Sofitel, The Palm Resort & Spa, Dubai. Banking is one of the fastest growing industries in the Middle East.With innovation as the focal point, banks are reinventing themselves and investing heavily in technology to deliver new-age banking solutions to consumers. The region’s banking and financial services sector is well poised for an overhaul. With over 40 sponsors and more than 30 top local and international industry experts providing insights into the banking innovation sector, this Summit will be even bigger than the previous years. The summit will feature more than 20keynote sessions and panel discussions on pressing issues and trends pertaining to the banking technology domain globally as well as in the Middle East,and will involve experts Gary Collins, Head – Mobile Banking, Westpac Pacific; Marcello Baricordi, General Manager UAE & Global Accounts Lead, Visa; Paolo Barbesino,Senior VP, Head of Digital – CEE Retail, UniCredit Bank Austria AG; KartikTaneja, Global Head – Credit Cards, Standard Chartered Bank, Singapore; Warren Cammack, Head of Innovation, Vietnam International Bank and Pedro Cardoso, Head of Multichannel and CRM, Emirates NBD amongst many others. Moreover, a powerful line up of speakers from local banks including Noor Bank, Commercial Bank of Dubai, Abu Dhabi Commercial Bank, National Bank of Abu Dhabi, First Gulf Bank will dive deeply into topics to share best practices and lessons-learned. Thissummit agenda will coverforward-thinking topicsthat have been tailored to the interests of the participants and are pertinent to the region. Ranging from payments and innovation in developing markets to capitalizing on the social media revolution; from the future of cashless transactions in the Middle East to transforming compliance burdens into business benefits, the summit will offer attendees a wholesome view of the banking industry. The premium sponsoring companies such as Visa, Schneider Electric, IBM, Sestek, Oberthur Technologies, IMTF, CSC, Backbase, InfrasoftTech, Comarch, Entera, intellect, Collinson group, Cryptomathic, Appello will showcase some exciting solutions at the Innovation Lounge. Additionally, experts from these organizations will engage in a 20-minute session to share lessons learned that will help propel the industry forward. Included within the Summit’s delegation list are over 450 representativesfrom leading banks in the Middle East region, such asAbu Dhabi Commercial Bank, Dubai Islamic Bank, HSBC Bank Middle East, Union National Bank, Mashreq Bank, Emirates NBD, ICICI Bank,First Gulf Bank, Deutsche Bank,RAK Bank,Commercial Bank of Dubai,Barclays Bank andDoha Bank, to name a few. 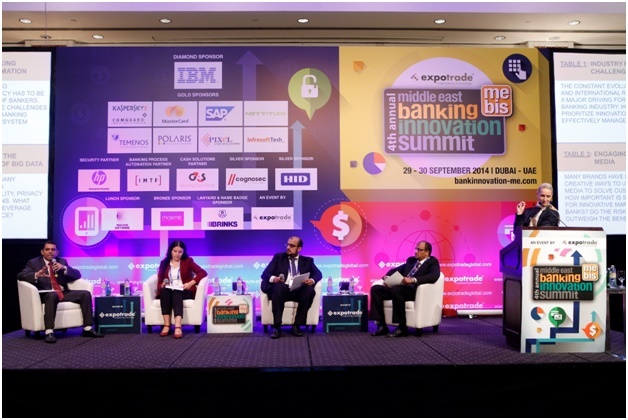 The 5th annual Middle East Banking Innovation Summit spread over the course of two days provides a gamut of opportunities for speakers and delegates to connect in an interactive manner, engage in cross learning and discuss business opportunities and challenges.